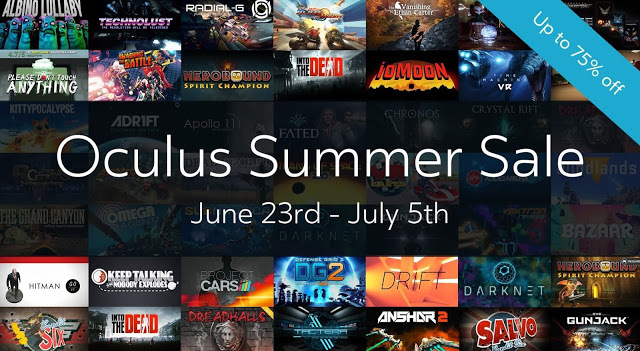 DEALS: Over 50 apps on Oculus Rift and Gear VR are on sale up to 75% off! Gunjack: This is one of the killer apps for the Gear VR, part of the EVE: Valkyrie universe. In this one, you’re fending off invaders with a turret gun. Very comfortable to play. I love it! Anshar Wars 2: There are also many fans of this shooter, which has been compared to Nintendo’s StarFox. The graphics rival those of Gunjack, and the controls work very well. I didn’t get dizzy even though the plane flies around. I love this game. End Space: Although Gunjack is touted as the premiere shooter for Gear VR, many say End Space is better. Unlike the stationary turret in Gunjack. in this game you’re flying a spacecraft so it’s more like a flight simulator, and I am guessing more similar to EVE: Valkyrie (which I haven’t tried). Caution: I did feel a little nauseated with this. Darknet: This is my favorite game for the Gear VR. Seriously underrated. It’s an arcade puzzle type of game (like Bejeweled, etc.). In this one, you’re a hacker trying to infiltrate a system using tools such as viruses and worms to defeat antivirus programs and firewalls. My 8-yr old son really likes this game too. Land’s End: This puzzle game almost always appears on lists of the best games for the Gear VR. Very well made but short. Herobound Spirit Champion: This is an Action RPG adventure like the original Legend of Zelda games. It’s 3rd person view but in VR, so it’s like you’re watching the characters move in a diorama, a beautifully detailed one if I might add. I really enjoy this game and it’s a great game for those who are susceptible to vertigo. There’s a free demo of Herobound: Gladiators, which has a similar concept so you can see if you like it, but FYI Spirit Champion is 1-player (and seems more detailed) while Gladiators is multiplayer. Spirit Champion is closer to a real adventure, while Gladiators seems more like just battles. Archer E. Bowman. You’re an archer defending a fort from waves of monsters. The shooting mechanics work very well. There are parts where you will have to move a bit, which at first got me a little nauseated but I got used to it. I have a lot of fun with this one. Dreadhalls: This is a popular survival horror game where you’re in a type of a labyrinth escaping from some creatures. On one hand, I am impressed by how intense the game is. I’m amazed how creepy it feels even though the graphics are not photorealistic. On the other hand, just moving around in this game made me feel nauseated. I suggest you try the demo first. Tactera: like StarCraft in VR. There is a demo available. Note: many of the games require a Bluetooth controller. The one I use is the True Depth 3D BT Motion Wireless Bluetooth Gamepad. I like it because I prefer the PS3 style controls (as opposed to Xbox style controls), it connects easily, works flawlessly, turns off automatically when you turn off the Bluetooth on the phone, and it’s rechargeable (via USB).